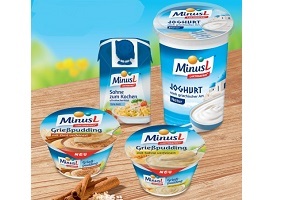 German based dairy specialist Omira Oberland is widening its range of lactose-free products under the Minus L brand with the launch of three new products, according to reports in Lebensmittelzeitung. The first new product added to the lineup is Minus L Semolina Pudding, which is being made available in Cinnamon and Cream varieities. Also joining the range is Minus L Greek Yogurt and Minus L Cooking Cream, the latter with 15% fat. The semolina pudding is priced at an RRP of €0.79 ($0.87) for a 125g pot while the greek yogurt comes in a 400g pot for an RRP of €1.29 ($1.42). The cooking cream comes in a 200ml carton for an RRP of €0.89 ($0.98). The products join the existing Minus L lineup that includes milk, milk drinks, dairy desserts, cream, chocolate products and cheese.